[PDF] Revolution or Renaissance: Making the Transition from an Economic Age to a Cultural Age (Governance Series) | Free eBooks Download - EBOOKEE! Posted on 2018-01-29, by luongquocchinh. 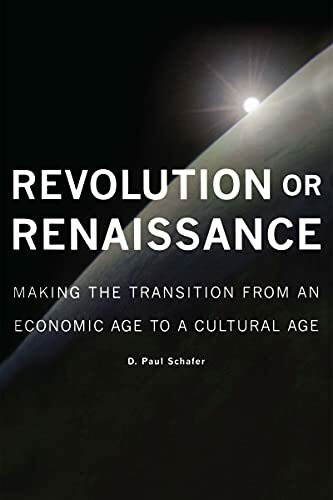 Description: In Revolution or Renaissance, D. Paul Schafer subjects two of the most powerful forces in the world â€“ economics and culture â€“ to a detailed and historically sensitive analysis. He argues that the economic age has produced a great deal of wealth and unleashed tremendous productive power however, it is not capable of coming to grips with the problems threatening human and non-human life on this planet. After tracing the evolution of the economic age from the publication of Adam Smith's The Wealth of Nations in 1776 to the present, he turns his attention to culture, examining it both as a concept and as a reality. What emerges is a portrait of the world system of the future where culture is the central focus of development. According to Schafer, making the transition from an economic age to a cultural age is imperative if global harmony, environmental sustainability, economic viability, and human well-being are to be achieved. No comments for "[PDF] Revolution or Renaissance: Making the Transition from an Economic Age to a Cultural Age (Governance Series)".